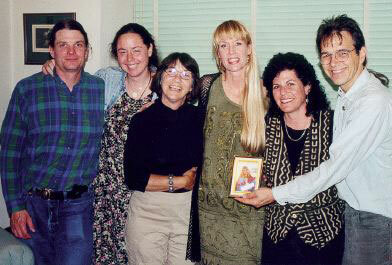 Amy Ralston Pofahl celebrates her release on Presidential Clemency with (left) former POWs Pat and Heather Jordan, Virginia Resner of HRDW, Free Amy, and Mikki Norris and Chris Conrad of HRDW. Chris is holding one of the "Free Amy" postcards we distributed during the campaign for her release. We wish an early release to all non-violent offenders of the Drug War. Amy was incarcerated in 1991 for crimes she did not commit. The Free Amy Campaign is pleased to announce that President Clinton gave her executive clemency on July 7, 2000, after 9 years in prison. Send a thank you letter to President Clinton for signing the clemency request for Amy. He did the right thing. Glamour magazine, June 1999. "Jailed Unjustly: Does This Woman Deserve to Be Locked Up for 24 Years?" Featured in Shattered Lives: Portaits from America's Drug War. "If the laws do not change, I will spend the majority of my adult life in prison. Amy's husband was Charles "Sandy" Pofahl, a graduate of Stanford Law School, successful Dallas businessman, and twenty years her senior. They were married for a few years, until she could no longer handle his alcohol problem. In 1989, they had been separated for a year and Amy had her own promotional company, Prime Time, in Los Angeles, when her nightmare began. She found out that her estranged husband had been arrested in Germany for manufacturing and distributing ecstasy (MDMA). He mistakenly thought it was legal there at the time. Some of the ecstasy was traced to the US market. Amy went about helping her husband out during his early confinement and trial. As a result, she also became a target of the US government. "Federal agents promised that if I refused to help them gain the information against my husband, they would destroy my life. This they did." Friends and business clients of her thriving, new company were intimidated by agents. The agents told people that Amy was a drug dealer and associating with her would get them in trouble. Then, Amy was arrested and charged with conspiracy to commit the crimes previously attributed to her husband and his co-defendants. She was also accused of money laundering. Amy refused to plea bargain or 'cooperate' in giving information that she didn't have. On top of that, she was misinformed about her rights by her court-appointed attorney, who failed to present certain evidence or call witnesses in her case, as she requested. Further, the prosecutor was able to move the trial to Waco, Texas where the judge's court was reputed to have a 100 percent conviction rate. Her husband received a six year prison sentence in Germany, of which he served four. Amy was handed a 24-year sentence for his crimes and incarcerated in 1991. She launched a series of appeals and finally exhausted all her options. "So much for keeping the streets free of criminals by demanding harsh mandatory minimums, because every single person who pled and was guilty in my case was handed his freedom in exchange for testimony. "I can only speak for myself, but I am a witness to the type of women this drug war has attacked and victimized, and most do not belong in prison. If laws do not change, I will spend the majority of my adult life in prison. Is that fair to me, my family or the taxpayer? Who does it benefit? Please investigate my case and others. Visit a federal institution and witness for yourself who is filling these overcrowded prisons. You will be shocked. Please vote to change these unjust laws." Working from behind bars, Amy never lost hope and kept in contact with people on the outside, including Families Against Mandatory Minimums. The outrageous injustice of her case caused public outrage and drew media coverage. Her case was prominently featured at the premiere presentation of the Human Rights and the Drug War exhibiti at a United Nations commemorative event in San Francisco in 1995. Amy is pictured on the cover and her story discussed in the books Shattered Lives: Portraits From America's Drug Warand Human Rights and the US Drug War. It drew coverage in Glamour magazine and Court TV. 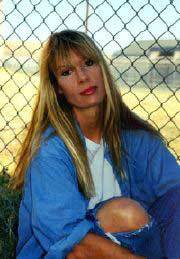 In January, 1999 a support commitee called the Free Amy Campaign was formed to work to Free Amy Pofahl. The campaign not only helped draw media to Amy's case, but it also used the Internet and postcards to publicize her situation. Numerous organizations lobbied on her behalf, and respected attorney Dale Bumpers lent his weight to the effort. Finally, after nine years in prison, President Clinton gave her a long overdue executive clemency on July 7, 2000. Although Amy is now freed, it does not erase the injustice she endured. Worse yet, there are many thousands of others who are still unjustly held behind bars who still need your help. As Amy's case shows, there is hope. Help turn the tide.